In the spirit of these problems, I’ve created my own sequence of Level A to Level E challenges involving absolute value. The sequence was originally inspired by a problem I saw in a student’s SAT review book. The SAT problem is more or less the same as Level D, and seems like an appropriate challenge for my Algebra 2 students. We’re about to begin our study of equations involving absolute value in my Algebra 1 class, so I wanted to adapt the problem (by “lowering the front of the of the ramp”) so it would be more accessible to that group of students. I also wanted to push the problem a bit further for my more advanced Algebra 2 students. Here’s what I was thinking at each level. Before we worry about efficient methods for solving equations involving absolute value, I want my students to develop their reasoning abilities with equations (or in this case, inequalities) involving absolute value. The expression on the left is a type I’ve seen hundreds of times, but the inequality as a whole (in particular, the inclusion of a variable on the right side of the inequality) is a new twist for me as a teacher. I anticipate some struggle here as students become familiar with the context, but once they realize what’s going on (and start plugging in various values of x to test them one at a time) I expect they’ll find success fairly quickly. In fact, if students start with integers (as I image they will) there are only four that will not satisfy the inequality. After I’ve baited them into the problem with an early dose of open-ended success, students will turn to a very similar problem with far fewer solutions. However, the method most students use to attack Levels A and B will likely be the same, so this second stage demands perseverance more than new methods. Now we’re pushing toward the idea of an interval, and possibly the use of more efficient techniques to solve for the endpoints. Students may have a head start here based on what they stumbled across in Level C.
If any of my students race through Levels A-D, I want to have a challenge that may hold their attention for a bit longer. Maybe they learned something about the relationship between 3, 17, and the interval endpoints in Level D. This fifth challenge will push them to describe that relationship with clarity. I haven’t used this yet with my students, though I will very soon. 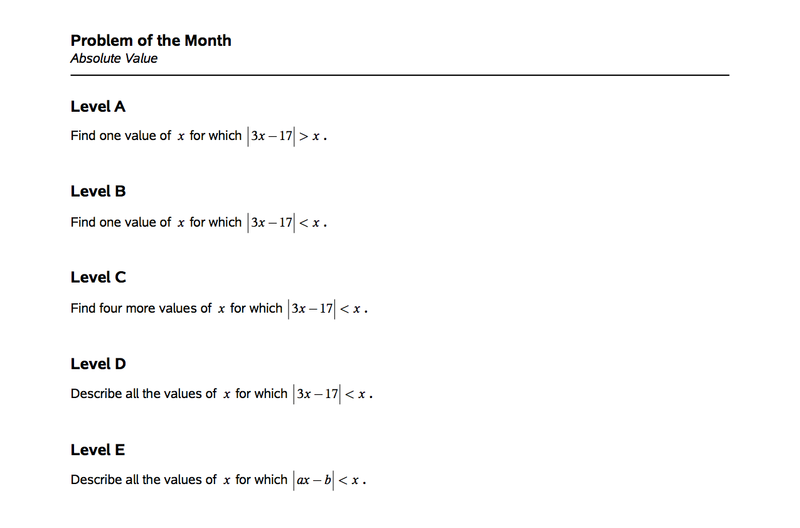 And I’m not sure I’ll get the whole school on board this round with an untested problem. For all I know, this could be too easy, to difficult, too boring, or too something else. I’ll post an update after we’ve explored the problem. Feel free to drop a comment on the quality of the problem, or ideas for improving it (whether you use the problem with your students or not). Problem solved! 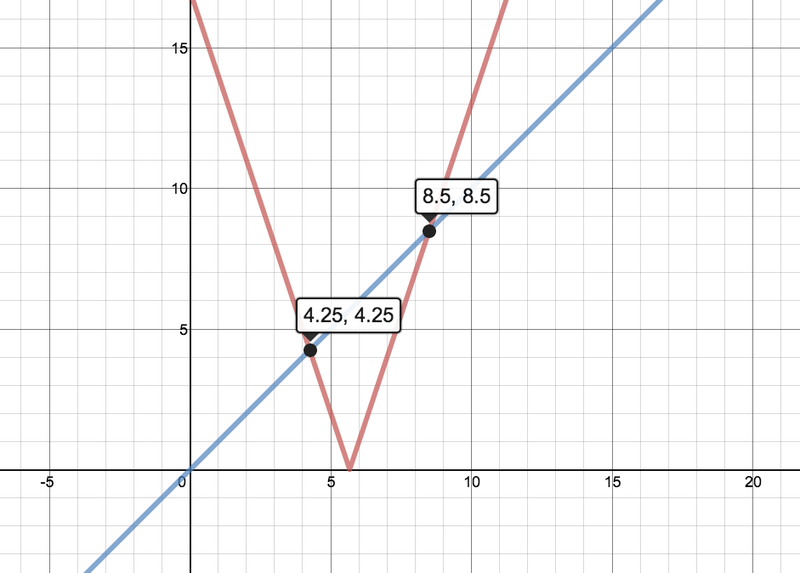 Any x-value between 4.25 and 8.5 will satisfy the original inequality ( ). But then I wondered about changing the parameters. Time for sliders! Click to be transported to a land of dynamic slider action! Anyway, that’s how Level E was born. I still had to lower the ramp at the front of the problem, so that’s where Levels A-C came from. I’d love to hear what you think. If you have anything to share, drop a line in the comments!